Then after too many tries I disabled EagleGet extension and then download with Firefox built-in downloader and then It was downloaded with just one click. Please help me fix all of the glitches of your software. Thanks & Sorry for the bad English. If the extension fails to capture or download Youtube videos, you can use MediaGrabber feature in EagleGet UI to download them. To continue download when the links are expired you can right click on the download task and click Refresh download address to resume it. 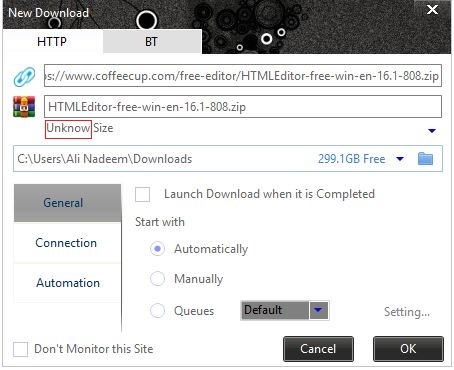 When certain sites do not allow downloading with multiple threads as in your example with the screenshot, you can click on "Connection" in the left side bar and then set the no:of threads for that download site as 1 instead of 8. Yes bro, I already know that Media Grabber thing but the problem I am facing is that I cannot download video with sound in 480p Quality or above. Below down 480p are fine. But I really needs to download some videos in HD Quality. Even when I tried to download the 480p/720p DASH video where EagleGet says that It will automatically download the FFmpeg software and merge the audio file into video. But then It will take forever time while Merging the video. Please solve this bug or tell me If there is any manual option in the EagleGet settings to merge the audio file into video or tell me how to use the command-line utility tool FFMpeg to directly convert the audio file into with video. Whenever I use that (Refresh Download Address) option, The EagleGet downloads the webpage document instead of the file. Well, That is working on some sites but on some sites, Even If that work, The entire file will restart and download again. Nice, This one I don't know already. I'll try this If I would failed on future downloads. Thanks for your help buddy.